So unless you don’t have anything on your computer that you can’t do without you need to find some backup solution. I am not going to say you need to spend a lot of money by using a company to backup your computer for you but that is an option and I will give you some companies that a reputable. Now before we talk about backing up your data you want to make sure you have copies of the applications you have on your computer as well as Windows or Mac or Linux installation media. If you bought your computer from a store or online retailer you most likely didn’t get an installation disk for your operating system. 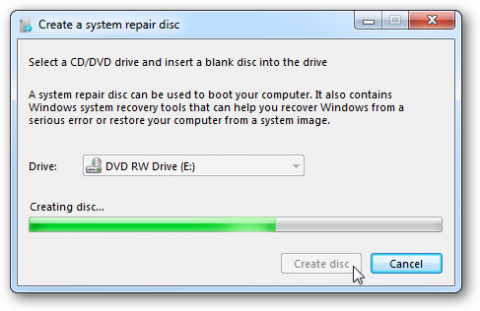 To make a specific system restore disc you can contact the computer manufacturer and they will have instructions on how to make restore discs. If you have Windows 7 you can make a restore disc right from Windows. To do so go to start then in the search type in: system repair disc then hit enter and go through the steps and you will have a system repair disc. The next thing you are going to want to have is installation files for all your applications. If your computer crashes you will need to reinstall all the programs you had on your computer. Software you bought in store should have install disks so you want to keep them in case you need to reinstall, but software that you buy online and download you won’t have and install disk so you will have to download them again and that is fine for small applications but if you have programs that are several gigs it will take a long time to download and reinstall. To save you from having to do that you might want to create a folder anywhere on your computer and name it applications or downloaded apps and once you download and install the application you move the .exe install file to the folder and then you can copy that folder to a usb flash drive or external hard drive and if you need to reinstall you won’t have to download all those files. After you have done those two steps then check out my next segment on What to backup. If you have any questions on these steps please send me an email and I will try to help you out.